Can a cup of tea change the world? A new exhibition at the Foundling Museum in Bloomsbury is inviting visitors take home tea cups labeled with good deeds, and then follow through on those pledges. Located in a quiet corner of Brunswick Square, the Foundling Museum is one of London’s true hidden treasures. Commemorating the history of Thomas Coram’s Foundling Hospital — itself established in 1741 as a refuge for abandoned and underprivileged children — the Museum houses a spectacular art collection that includes works by everyone from William Hogarth (if ever you’ve wondered what nearby Tottenham Court Road might look like without the electronics shops and branches of Pret, his astonishing satirical painting March of the Guards to Finchley is a must-see) to Tracey Emin. In keeping with its stated obligation to nurture, it regularly enlists the services of young artists to create fascinating and thought-provoking exhibitions, the latest of which is Exchange: 1,000 Good Deeds by ceramicist Claire Twomey. Taking inspiration from the Foundling Hospital’s philanthropic origins, Twomey has inscribed 1,550 cups and saucers with individual instructions for good deeds, examples of which might be anything from ‘make a pot of tea for your neighbour’ to ‘foster a child’. 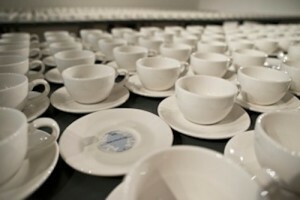 Every day for the duration of the show, ten visitors will be selected to lift a cup and read the instruction on its saucer; if they feel capable of performing the deed requested they may take the cup home, provided they do what is asked of them. The hope is that the show’s appearance — from vast, impersonal ranks of china to an intensely personal collection of noble acts — will change every day as more and more cups are taken and good deeds performed. It is a physical manifestation of the ‘trade-off’ required for the Museum’s unique brand of philanthropy to work — a charitable form of Russian roulette, if you will. Peculiar as it may sound, we couldn’t help but be moved. This is an exhibition for the head, the heart and — with any luck (and a little generosity) — the tea set. You could do many worse deeds than paying a visit. Exchange: 1,000 Good Deeds is on at the Foundling Museum until 15 September. Free with Museum admission (£7.50). Booking not required. Please note: 10 visitors will be randomly selected each morning to have the opportunity to take a cup. The exchange will take place between 12.30pm and 1pm.